The selection of Dr. Lily D. McNair as Tuskegee University’s eighth president is being hailed by university community members as precisely who the institution needs to ensure its future legacy in higher education. Following a unanimous vote by the Board of Trustees, Tuskegee administrators and others welcomed McNair’s appointment as president this week, noting her prior academic service and commitment to students. McNair is provost and senior vice president for academic affairs at Wagner College in Staten Island, NY. 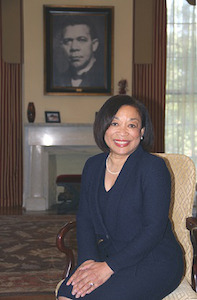 Beginning July 1, she will join the ranks of Tuskegee presidents, making history as the first permanent woman president to lead the institution in its 136 year history. The line of presidential predecessors includes legendary educator and thought-leader Booker T. Washington, the institution’s founder and first president. Rowe, who also served on the presidential search committee, praised McNair for her “great interpersonal skills,” integrity and “high degree of energy” that, he said, will help Tuskegee progress. Wagner College President Dr. Richard Guarasci congratulated McNair on her new appointment. He highlighted the “intelligence, professionalism and grace” McNair demonstrated while serving as provost for the last seven years at the college. McNair – a clinical psychologist by training – earned a bachelor’s degree from Princeton University and a master’s and doctoral degrees in psychology from the State University of New York at Stony Brook. Prior to her academic service at Wagner, McNair served as associate provost of research and divisional coordinator for science and mathematics at Spelman College. Before transitioning to Spelman, she served as associate professor of psychology and associate director of the Clinical Psychology Doctoral Training program at the University of Georgia. McNair was the first African-American woman in UGA’s psychology department to receive tenure and promotion, in 1999, and she has received funding from the National Institute of Mental Health and the Centers for Disease Control and Prevention for her research. She also is a co-editor of the fourth edition of the women’s studies textbook Women: Images and Realities: A Multicultural Anthology. The New Jersey native’s appointment as Tuskegee’s next president comes after a six-month national presidential search that began Oct. 18, 2017. McNair will succeed interim president Dr. Charlotte P. Morris, who will assist with the transition in leadership and continue at the university as a faculty member this fall semester in the Brimmer College of Business and Information Science.